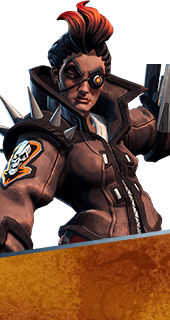 Reyna is a Hero in Battleborn. She is unlocked at Command Rank 8 or by achieving 50 assists in competitive matches. Reyna makes use of her highly adaptable and durable shield system to compensate for relatively low health. Increases Laser Pistol damage. +18% Laser Pistol Damage.